Four years after the events of Penric’s Demon, Pen has settled into an insulated life in Martensbridge. He’s grown in his maturity, and his relationship with Desdemona has somewhat settled down. They’ve gotten used to each other, and settled into how their life together will function on a day to day basis. While Pen’s passion project is copying Learned Ruchia’s volumes on sorcery and magic so that it can be distributed to the other Temples, there is still plenty about magic and demons that he, and even Desdemona, don’t know. There’s the magic that is taught in the schools and temples, magic education and knowledge that can be controlled. And then there’s the hedge magic, magic learned by accident and never written down only passed around orally. There’s this neat undercurrent in these novellas about official scholars who want only the magic they teach (and control) to be seen as “good” magic, and anything outside these scholarly and proscribed is considered dangerous to the safety of all. If while reading Penric’s Demon, you had hoped for more explanation about how the magic system worked, and what exactly demons are, you’ll be pleased to know that there is a fascinating conversation near the beginning of Penric and the Shaman where Pen takes the opportunity to explain the difference (now that he understands it himself!) between magic that descends from gods and demons and hedge shamanic magic, which is believed to be taken up from the earth and mortal animals. Penric’s Demon is the shortest and most focused of the novellas in this series, and I appreciate that Bujold waited until a little later in the series to explain how everything works, rather than bog down the opening novella with it. The Princess-Archdivine tasks Pen with travelling with Locator Oswyl to assist him with investigating a Shamanic murder. A less skilled writer could easily have taken this story down the road of standard police procedural starring two unlikely partners. Luckily, it was written by Bujold, so while yes, there is an investigation of sorts, and yes, Pen an Oswyl are absolute opposites and aren’t sure what to make of each other, there is nothing standard about this story and it doesn’t feel like a procedural. It feels more a ghost story, and a story about knowing how and when to let go, actually. Something that caught me off guard in this novella is that there are three point of view characters. We see a lot of scenes from Oswyl’s point of view, which is entertaining, because Oswyl sees Pen as a bit of a freak. Luckily, Oswyl is a generally a rule follower, and has a growing respect for Pen’s knowledge and skills. We also get a number of scenes from the point of view of Inglis, a tribal Shaman who is accused of murder. Getting to know Oswyl and Inglis was nice, but that meant less space for inner dialog between Pen and Des. So Yes, I was hoping for more Pen and Des! What I’ve always like about how Bujold writes is that she focuses on the quiet moments between people. And I love the way she does it. Maybe someone notices that someone else is compassionate towards a stray dog. Maybe it’s the bored companionship of a long journey, or knowing when words aren’t necessary. I feel like her characters are truly interacting with each other and actively listening to each other, rather than waiting impatiently to say their next witty line of dialog. While Oswyl would be happy to just drag Inglis back to the city for judgement, Pen is fascinated by this tribal shamanism. This is his opportunity for an education that would be impossible to get back at the Temple. The two of them sit and practice their craft, teaching each other and leaning on each other, you’d never know one of them is about to stand trial for murder. Penric sure has come a long way from when we first met him! As this is a murder mystery of sorts, the big question is do Penric and Oswyl discover the truth behind the death of Tollin? They sure do. And what they learn adds a whole ‘nother level to the worldbuilding. Another thing Bojuld does effortlessly is world-build without you realizing what she’s doing. Similar to Penric’s Demon, it’s the closing scenes of this story that truly knocked my socks off. The scenes at the end of this novella got me asking myself all sorts of fun questions, such as “what is a god’s job?”, and I ask that as a serious question. If you’re going to write fiction that involves people talking about, thinking about, and/or praying to gods, it is interesting to think about what will happen next. Does the god answer prayers? Do people expect their prayers to be answered? What types of life events is a god interested in? The harvest? Birth? Death? Does a god care that you get through a mountain pass alive? Do gods do whatever they want haphazardly? Or do they do what needs to be done? I bring all of this up because it’s touched on at the end of Penric and the Shaman, and done in an absolutely beautiful way. Maybe Penric will start asking those questions too. Maybe not. He’ll need to be careful, because at the mere mention of gods and their mortal representatives, Des curls up into a ball of fear. What I love about reading Bujold is that reading her work makes me want to do nothing but read more of her work. 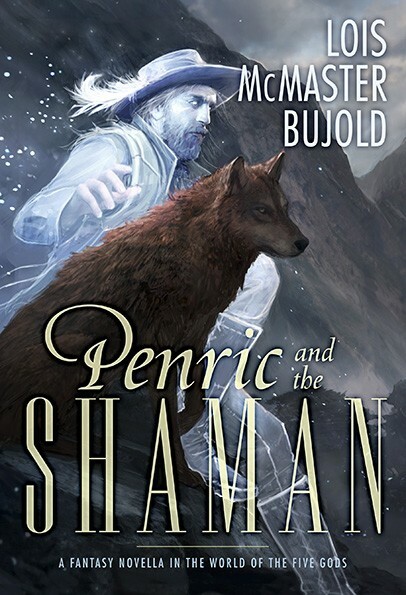 2 Responses to "Penric and the Shaman by Lois McMaster Bujold"
I just wanted to say thanks for the review. As someone who has read the books in the Five God’s series, and then read the novellas, I came into the novellas already knowing the background pretty well. I am finding it fascinating watching the reactions of someone who came to them fresh, and comparing them to mine. Even though I’m getting into this series backwards, these novellas do make me want to read the Five God’s novels. I’ve experienced something similar you to, where someone gets into a series I’ve enjoyed all along through a mid-way entry point. I enjoy the same things about the situation as you do – and I’m also a little jealous of those folks, they are getting to discover this for the first time.